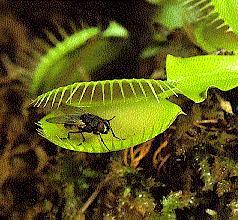 The Venus Flytrap is the best known of the carnivorous plants. It grows in a circular cluster which measures about 15cm (6 inches) across when fully developed. Each leaf in the cluster can grow up to 7 or 8 cm (about 3 inches) in length. At the end of each leaf is a deadly trap for insects! The trap is green on the outside and a radiant red color inside with a sweet-tasting nectar which attrackts bugs. Two winglike lobes create the shape of the trap. The lobes are joined together at one end and stiff, long bristles along the outer edges of the lobe. Inside each lobe there are 3-4 short trigger hairs. These hairs activate the trap to snap shut. The trap does not close every time a trigger hair is touched because a lot of energy would be used up this way. A trigger hair must be touched more than once or two trigger hairs must be touched with in seconds of each other. This is how the trap knows to snap on a moving insect and not on a raindrop which only touches a trigger hair once. When a moving insect is in the trap it touches 2 or more trigger hairs and snap! When the insect touches these hairs it sends an electric impulse throughout the leaf. This electric impulse causes the leaf's cells to expand like balloons and this sudden expansion forces the trap to close. If the trap closes on a piece of grass or a small twig it later opens in one day because the trap can not digest the grass or twig. When the trap closes on an insect it releases digestive juices. The digestive juices flow out of the leaf glands and dissolve the insect's body into smaller pieces. The lobes of the leaf stay closed from 8-10 days. The digested insect pieces are dissolved into a liquid soup. The soup is a mixture of minerals, protein and other juices that are absorbed by the leaf as nutrients. After the leaf has received nutrients, the trap opens only an insect skeleton remains and it is blown away by the wind. The Venus Flytrap is again ready for another insect meal. 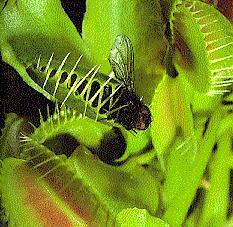 Almost any insect can be a meal for the Venus Flytrap. The most common insects trapped by this plant are ants, but flies, bees, wasps and moths are still victims. Large insects like snails or grasshoppers may be strong enough to force their way out of the trap but if not, the trap may have trouble closing because the insect is too big. If the trap can not close the dead insect will not be digested and will rot. The rotting will spread to the trap and kill the leaf. The Venus Flytrap will then grow a new leaf to replace the dead one. Another time the Venus Flytrap grows a new leaf is after a leaf has withered. Every leaf withers because each trap can only digest three meals. After each meal the Venus Flytrap grows. 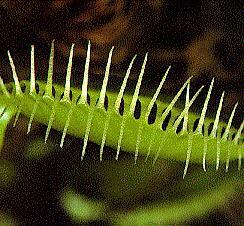 The Venus Flytrap grows taller in the spring, than after any meal. A 30 cm (1 foot) long stem bearing white flowers grows straight up towards the sky during the spring time. The white flowers have seeds which the wind scatters in different areas and then new Venus Flytrap plants grow. These new plants have traps like all Venus Flytraps and that catch bugs in a snap! 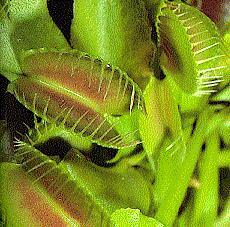 The scientific name for Venus Flytrap is Dionaea muscipula. You may want to use this name to find more information under botanical and plant science topics on the internet and in books.